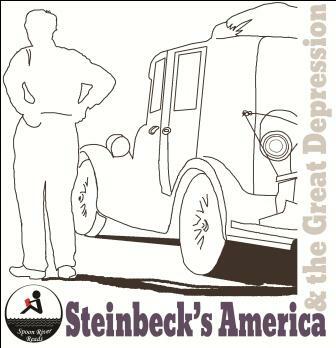 Spoon River Reads 2013 selection is Steinbeck's America & the Great Depression. Mr. Knox's College English class will read excerpts form various Steinbeck works including Travels With Charley: In Search of America. 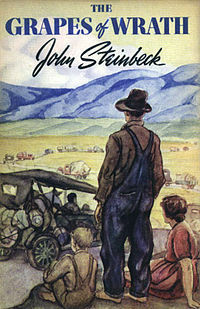 The Grapes of Wrath, first published in 1939, Steinbeck’s Pulitzer Prize-winning epic of the Great Depression chronicles the Dust Bowl migration of the 1930s and tells the story of one Oklahoma farm family, the Joads-driven from their homestead and forced to travel west to the promised land of California. Out of their trials and their repeated collisions against the hard realities of an America divided into Haves and Have-Nots evolves a drama that is intensely human yet majestic in its scale and moral vision, elemental yet plainspoken, tragic but ultimately stirring in its human dignity. Travels with Charley: In Search of America is a travelogue by American author John Steinbeck. It documents the driving trip he took with his poodle, Charley, around the United States in the 1960's. He wrote that he was moved by a desire to see his country on a personal level, since he made his living writing about it. He had many questions going into his journey, the main one being "What are Americans like today". However, he found that the "new America" did not live up to his expectations.